Is it ethical or legal to dose detainees with oxytocin, the naturally occurring “love chemical,” to enhance interrogation? What about giving soldiers drugs intended to prevent post-traumatic stress disorder? Should external electrical stimulation be used to help warfighters learn their jobs more quickly? And what if it turns out that certain genes that design brain circuits can lead to an increased propensity for political violence? Science Progress Editor-In-Chief Jonathan Moreno discussed these and other questions addressed in his updated book, Mind Wars: Brain Science and the Military in the 21st Century at the Center for American Progress on May 8. The discussion was moderated by PJ Crowley, a former State Department official who now leads an effort at Penn State University and the U.S. Army War College to enhance the civilian-military dialogue. The two discussed the past, present, and future of brain research in the military and counterintelligence —a field Moreno has dubbed neurosecurity. Central to the discussion was a review of efforts to achieve not only therapeutic results, but even making warfighters “better than well,” and emerging ethical questions around new discoveries in genetics, remote warfare, and brain-machine interfaces could affect soldier selection and readiness, interrogation tactics, and the size and scope of the battlefield. National security agencies began experimenting with psychoactive chemicals, such as LSD, in the 1950s to ascertain their effectiveness as a “truth serum” or to cause disarray among enemy combatants. As technology has advanced, so too have the ethical questions raised. Today research on oxytocin—a brain chemical involved in forming trusting, emotional bonds and feelings of love and affection—raises questions about its use in artificially boosting trust in targets of interrogation. Though oxytocin is a naturally occurring chemical in the body, would its use against suspected terrorists during interrogation violate human rights law? Militaries have experimented with ways to enhance soldiers’ cognitive function for more than 100 years, noted Moreno. Sustained alertness was one of the first objectives of such research, and the Prussian army experimented with cocaine as far back as the late 1800s. Caffeine and nicotine were used for this purpose during the World Wars, and in Vietnam methamphedamine (speed) became the stimulant of choice for many. In the 1980s a new drug, modafinil, entered the scene. Approved for the treatment of narcolepsy, the drug has been shown to extend alertness for as long as 60 to 70 hours among some people with normal sleep-wake cycles. The drug, branded as “Provigil,” has recently gone off patent, meaning that cheap generic versions of the drug will become available. Last year the People’s Liberation Army of China announced that it had developed its own “anti-sleep” pill. In the new edition of Mind Wars, Moreno addresses new attempts by the Defense Department to improve soldier performance beyond alertness. One such area is in preventing post-traumatic stress disorder, or PTSD, using beta blockers—drugs that diminish the brain’s uptake of stress hormones. While research in this area is young, some have suggested that giving this drug immediately after or even before stressful combat situations could help prevent post-traumatic stress disorder. But such tactics raise the possibility of also reducing potentially healthy feelings of shame, regret, and remorse. While some soldiers might prefer to avoid all of the negative emotions associated with combat, the reintegration of “guilt-free soldiers” into society comes with its own set of social questions and risks, Moreno and Crowley concluded. On the horizon is the expanding field of brain-digital interface. Devices have already been built that use brain activity to control basic machinery, such as a prosthetic limb. This can be achieved either through implantable devices that directly interface with the brain, or external neuro-modulation, perhaps integrated into a helmet. As this technology improves, military commanders, or even smart computer algorithms, may one day be able to digitally monitor soldiers’ cognitive function. Such algorithms could potentially even intervene under certain circumstances, for example, by down regulating stress pathways for operatives in tense and isolated settings. With soldiers’ very minds being controlled to some extent by a digital device, the question of where we draw the line between man and machine becomes blurred. Looking ahead: A human arms race? These new neuroscience options raise the question of whether the traditional idea of a warfighter’s individuality and honor will have a place in the conflicts that lie ahead. And as military technologies have a tendency to bleed into society at large, how do we deal with their implications for civilian life? To answer this, Moreno and Crowley proposed two basic principles: First, the individual should have control over the contents of his or her mind. Second, the individual gets to decide who gets access. As innovation in this field proceeds, Moreno also wondered whether we risk entering a human arms race, with militaries competing to have the most highly enhanced super soldiers. Such an arms race would have profound ethical implications, both for test subjects of the research and for how we view the balance between soldier as citizen and soldier as tool. You can learn more about these questions by reading the new paperback edition of Mind Wars and by watching the event video. Is it ethical or legal to dose detainees with oxytocin, the naturally occurring “love chemical,” to enhance interrogation? What about giving soldiers drugs intended to prevent post-traumatic stress disorder? Should external electrical stimulation be used to help warfighters learn their jobs more quickly? And what if it turns out that certain genes that design brain circuits can lead to an increased propensity for political violence? 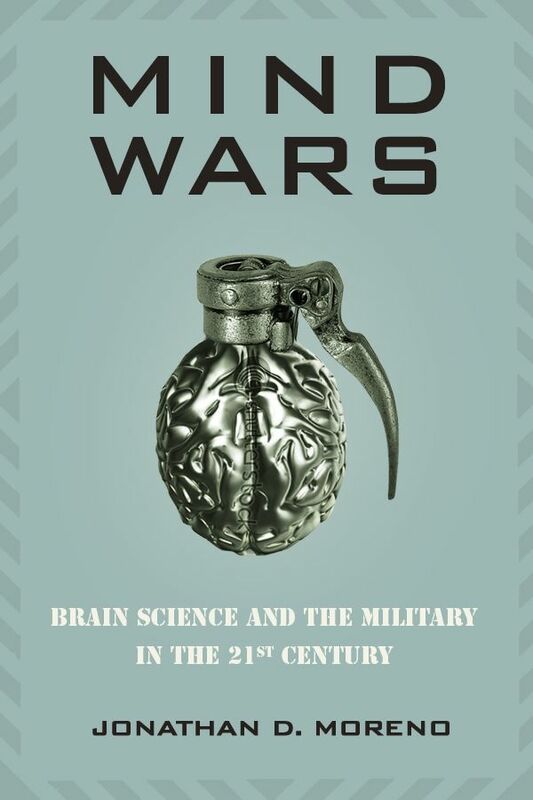 Science Progress Editor-In-Chief Jonathan Moreno discussed these and other questions addressed in his updated book, Mind Wars: Brain Science and the Military in the 21st Century at the Center for American Progress on May 8. The discussion was moderated by PJ Crowley, a former State Department official who now leads an effort at Penn State University and the U.S. Army War College to enhance the civilian-military dialogue. The two discussed the past, present, and future of brain research in the military and counterintelligence —a field Moreno has dubbed neurosecurity. Central to the discussion was a review of efforts to achieve not only therapeutic results, but even making warfighters “better than well,” and emerging ethical questions around new discoveries in genetics, remote warfare, and brain-machine interfaces could affect soldier selection and readiness, interrogation tactics, and the size and scope of the battlefield. National security agencies began experimenting with psychoactive chemicals, such as LSD, in the 1950s to ascertain their effectiveness as a “truth serum” or to cause disarray among enemy combatants. As technology has advanced, so too have the ethical questions raised. Today research on oxytocin—a brain chemical involved in forming trusting, emotional bonds and feelings of love and affection—raises questions about its use in artificially boosting trust in targets of interrogation. Though oxytocin is a naturally occurring chemical in the body, would its use against suspected terrorists during interrogation violate human rights law? Militaries have experimented with ways to enhance soldiers’ cognitive function for more than 100 years, noted Moreno. Sustained alertness was one of the first objectives of such research, and the Prussian army experimented with cocaine as far back as the late 1800s. Caffeine and nicotine were used for this purpose during the World Wars, and in Vietnam methamphedamine (speed) became the stimulant of choice for many. In the 1980s a new drug, modafinil, entered the scene. Approved for the treatment of narcolepsy, the drug has been shown to extend alertness for as long as 60 to 70 hours among some people with normal sleep-wake cycles. The drug, branded as “Provigil,” has recently gone off patent, meaning that cheap generic versions of the drug will become available. Last year the People’s Liberation Army of China announced that it had developed its own “anti-sleep” pill. In the new edition of Mind Wars, Moreno addresses new attempts by the Defense Department to improve soldier performance beyond alertness. One such area is in preventing post-traumatic stress disorder, or PTSD, using beta blockers—drugs that diminish the brain’s uptake of stress hormones. While research in this area is young, some have suggested that giving this drug immediately after or even before stressful combat situations could help prevent post-traumatic stress disorder. But such tactics raise the possibility of also reducing potentially healthy feelings of shame, regret, and remorse. While some soldiers might prefer to avoid all of the negative emotions associated with combat, the reintegration of “guilt-free soldiers” into society comes with its own set of social questions and risks, Moreno and Crowley concluded. On the horizon is the expanding field of brain-digital interface. Devices have already been built that use brain activity to control basic machinery, such as a prosthetic limb. This can be achieved either through implantable devices that directly interface with the brain, or external neuro-modulation, perhaps integrated into a helmet. As this technology improves, military commanders, or even smart computer algorithms, may one day be able to digitally monitor soldiers’ cognitive function. Such algorithms could potentially even intervene under certain circumstances, for example, by down regulating stress pathways for operatives in tense and isolated settings. With soldiers’ very minds being controlled to some extent by a digital device, the question of where we draw the line between man and machine becomes blurred. These new neuroscience options raise the question of whether the traditional idea of a warfighter’s individuality and honor will have a place in the conflicts that lie ahead. And as military technologies have a tendency to bleed into society at large, how do we deal with their implications for civilian life? To answer this, Moreno and Crowley proposed two basic principles: First, the individual should have control over the contents of his or her mind. Second, the individual gets to decide who gets access. As innovation in this field proceeds, Moreno also wondered whether we risk entering a human arms race, with militaries competing to have the most highly enhanced super soldiers. Such an arms race would have profound ethical implications, both for test subjects of the research and for how we view the balance between soldier as citizen and soldier as tool. You can learn more about these questions by reading the new paperback edition of Mind Wars and by watching the event video.